Signup Genius Links to Volunteer! Annunciation Catholic School promotes an environment in which the teachings of Jesus are proclaimed and lived as basic core values. 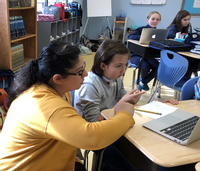 Through scripture, commandments, sacraments, liturgy and prayer, ACS helps students in PreK through 8th grade build a strong Christian foundation. 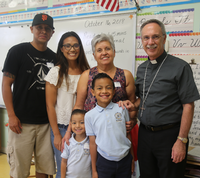 While the family is essential in building this foundation, the school takes an active supporting role by enriching the students' knowledge and worship of God and promoting love and care of their neighbors. Faith is fostered through liturgical celebrations, Mass preparation and outreach programs. Mass preparation helps students gain greater understanding of the Liturgy. Classes assist in preparing the Mass; they decide on the prayer intentions, are the readers, gift bearers and lead the songs. Every student participates. ACS outreach programs encourage social awareness and Christian love for all people. Our Mission: "Annunciation Catholic School provides our students with a foundation in the Catholic Faith and a strong academic education. We develop active citizens who live and love as Christ did. We make the world a better place. We pray. We learn. We love." The Diocesan curriculum guidelines, consistent with National Common Core Curriculum Standards, are followed for the teaching of all secular subject areas. The curriculum is marked by current content and fresh approaches to methodology. There is emphasis on principles rather than fact, on learning through problem solving and critical thinking, rather than by precept. We strive to offer a program which makes use of many sources of reading material, a wide variety of audio-visual and technology tools, and a multi-text approach to the content areas. Religion is taught according to the newly promulgated Religion Curriculum, which is the framework for religious instruction in the Diocese of Raleigh. “Faith must be known, celebrated, lived, and expressed in prayer. Catechesis comprises six fundamental tasks, each of which is related to an aspect of faith in Christ.” (National Directory of Catechesis, No. 20) The Diocesan Religion Curriculum is rooted in these six fundamental tasks: Knowledge of Faith, Liturgical Education, Moral Education, Teaching to Pray, Education for Community Life, and Missionary Tradition. Competitive sports are available to students in grades 4-8. Sports are an extension of Annunciation Catholic School. Athletes are held to the highest expectations for behavior and sportsmanship. Sports offered include volleyball, JV (5-6th grade) and Varsity (7-8th grade) boys and girls basketball, soccer and running club.